› Author Affiliations Funding This study was supported by a research grant from the Basic Science Research Program through the National Research Foundation of Korea funded by the Ministry of Education, Science and Technology (NRF-2017R1A2B3003303) and grants from the Korean Healthcare Technology R&D project funded by the Ministry of Health & Welfare (HI16C0058, HI15C1200). Background There have been no prior nationwide reports on the prevalence of hypertrophic cardiomyopathy (HCM) among patients suffering from atrial fibrillation (AF). It is also unclear how much stroke risk is attributable to HCM compared with other stroke risks in patients with AF. This study assessed the prevalence of HCM among non-valvular AF (NVAF) patients and to assess the magnitude of increase in stroke risk in NVAF patients with HCM, compared with those without HCM. Patients and Methods From the Korean National Health Insurance Service database from January 1, 2005 to December 31, 2016, we analysed 979,784 patients with prevalent NVAF aged 18 years or older. Results The overall HCM prevalence in NVAF patients was 1.1%. Although HCM in these patients is an absolute indication for oral anticoagulant (OAC) prescription, only 1,622 (15.3%) patients were receiving OAC at the time of AF diagnosis. Among OAC-naïve patients with NVAF, compared with those without HCM, those with HCM had the increased risk of ischaemic stroke/systemic embolism with clinical variable adjusted hazard ratio of 1.55 (95% confidential interval, 1.48–1.63; p < 0.001). Ischaemic stroke/systemic embolism rate of NVAF patients with HCM without any non-gender CHA2DS2-VASc stroke risk factors was 4.02 per 100 person-years, and approached to that of NVAF patients without HCM with CHA2DS2-VASc score of 3 (4.07 per 100 person-years). Conclusion Among all NVAF patients, 1.1% of patient has HCM. 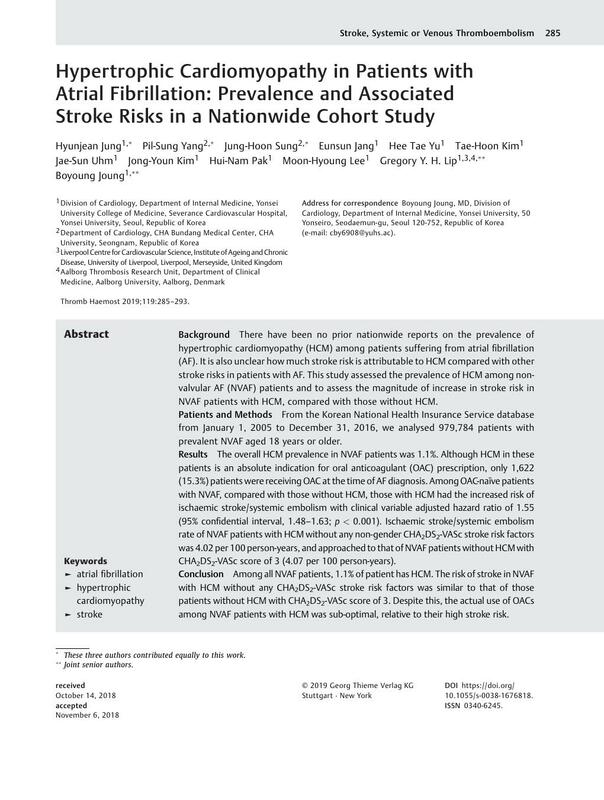 The risk of stroke in NVAF with HCM without any CHA2DS2-VASc stroke risk factors was similar to that of those patients without HCM with CHA2DS2-VASc score of 3. Despite this, the actual use of OACs among NVAF patients with HCM was sub-optimal, relative to their high stroke risk. H. Jung and P.S. Yang performed the statistical analysis and interpretation of data; P.S. Yang, B. Joung and G.Y. Lip conceived the idea of the project; P.S. Yang and E. Jang established the database; H. Jung, P.S. Yang and B. Joung. wrote the manuscript with input from all other authors; J.H. Sung, H.T. Yu, T.H. Kim, J.S. Uhm, J.Y. Kim, H.N. Pak and M.H. Lee contributed in revising the intellectual content; B. Joung and G.Y. Lip gave final approval of the version to be published. All authors discussed the results and contributed to the final manuscript. * These three authors contributed equally to this work.